A small country town overlooking Zurich Unterland. 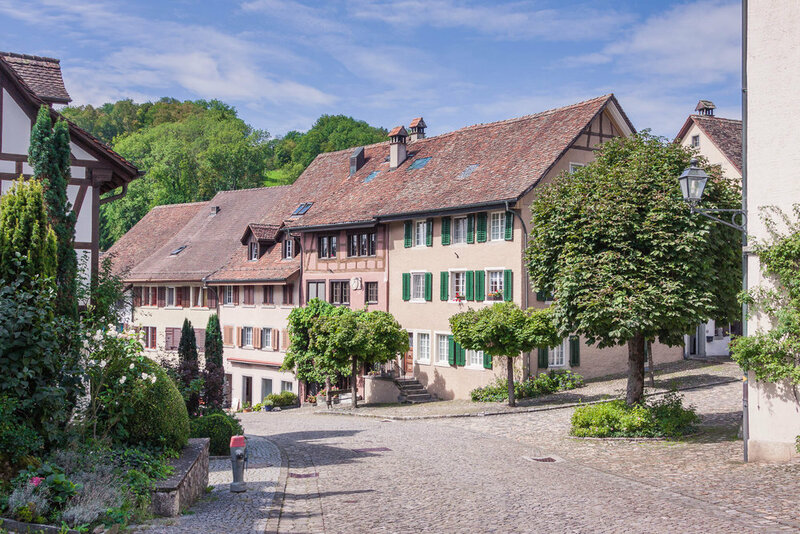 The only remaining parts of this castle are the Tower which overlooks this very pretty hilltop town that boarders between cantons Aargau and Zurich. The castle was founded by the House of Regensberg in the 13th century and is now looked after by the Regensberg Castle Foundation. Located on a hilltop, the original castle walls no longer exist and have been replaced by a ring of buildings that now make up the hilltop town. 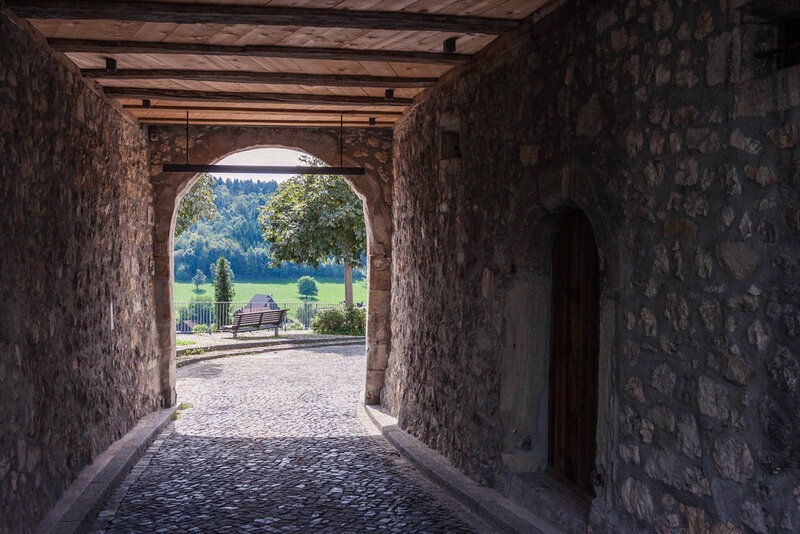 The walk up to the tower takes you through the beautifully manicured streets up to the arched main gate that leads to the heart of the inner town. What once was an outer wall has now been replaced by ring of beautifully restored buildings and homes. A great deal of time has been spent on the gardens that have been beautifully managed. 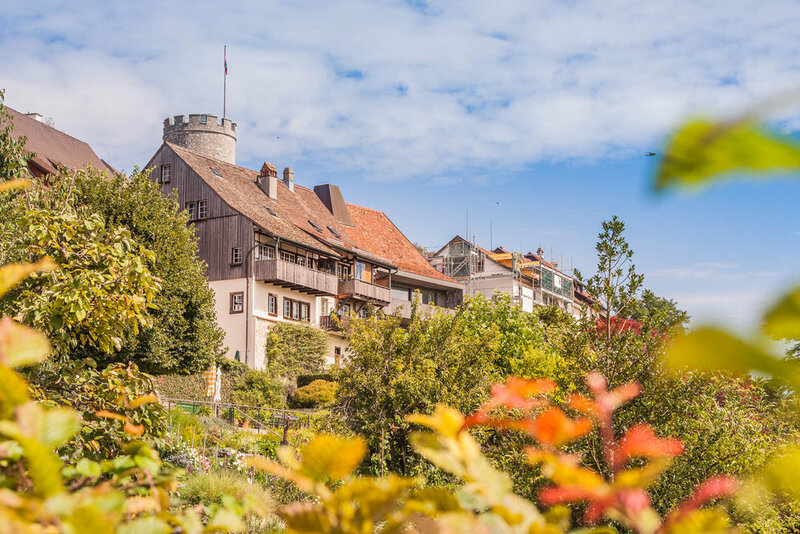 The tower is open to the public and for a small admission you can climb to the top of the tower and enjoy the view overlooking the northern Zurich region. As you climb to the top you can read up on the history of the castle and it's historical impact on the region. The town and it's tower would be the right description. Real castle feeling is going to be hard to find here. But that doesn't make it any less interesting to visit. Alone the walk up through the town is worth the trip. If you visit on weekends the restaurants will be open and you can enjoy some refreshments will taking in the sights. Added to this it isn't all to far from Zurich either. Either Lütold V von Regensberg or his son Ulrich (+ 1280) has established the fortified town of (Neu)-Regensberg, but when Lütold V died about 1250, his two sons Lütold VI and Ulrich divided the inheritance. Ulrich secured among others the fortified town of Regensberg. During the mid-13th century, the relations between the House of Regensberg and the city of Zürich became strained, and Ulrich came in conflict with the House of Habsburg inheriting the lands of extinct House of Kyburg, and Ulrich lost the Regensberger Fehde war of 1267/68. Ulrich died around 1280, and his son Lütold VIII had also to sell Regensberg to Habsburg-Austria in 1302. The Habsburgs mortgaged the castle and town several times, and in 1407 the so-called Herrschaft Regensberg was acquired by the city of Zürich. 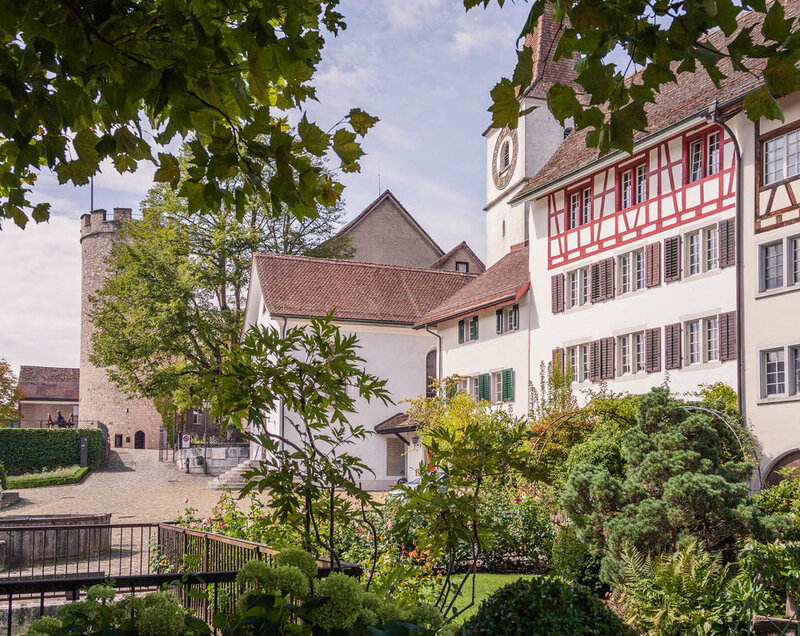 From 1417 the castle became the seat of the bailiff of the bailiwick of Regensberg (Herrschaft Regensberg, later Äussere Vogtei) of Zürich. On 6 June 1443 the council of Zürich forced their troops and the citizens to defend the fortified town lib und leben (analogously: faithful unto death), three days later the castle was conquered during the Old Zürich War by Zürich's contrahents, but not destroyed, and some months later manned again by Zürich troops. The castle grounds are open to the public. No admission.